Superman/Batman: Public Enemies is a 2009 animated superhero film based on the DC Comics story arc '"Public Enemies" in the Superman/Batman comic book series, written by Jeph Loeb & Ed McGuinness, which focused on Superman and Batman teaming up to prevent a meteorite from striking Earth, and taking down Lex Luthor, who has been elected President of the United States. Directed by Sam Liu and released by Warner Bros. Animation on September 29, 2009. It is the sixth film in the DC Universe Animated Original Movies. The film received generally mixed reviews upon release. Lex Luthor has been elected President of the United States during a severe nationwide economic depression. Under his leadership, the economy begins to thrive, and he assembles a force of government-employed superheroes consisting of Captain Atom, Katana, Black Lightning, Power Girl, Starfire, and Major Force. Superman and Batman maintain their distrust toward Luthor. The United States government discovers that a massive Kryptonite meteor is hurtling toward Earth. Instead of asking superheroes for aid, Luthor decides to destroy it with nuclear missiles. Luthor arranges a meeting with Superman in Gotham City under the pretense of forming a pact. This results in a battle with the hired Metallo against Superman and Batman, in which Metallo manages to injure them both. After, an unknown assailant kills Metallo. On national television, Luthor pins Metallo's murder on Superman, using footage of their battle to implicate him. Luthor claims that the meteor's radiation can affect Superman's judgment, and he places a one-billion-dollar bounty on Superman. Batman and Superman break into S.T.A.R. Labs seeking information on the meteor and find Metallo's remains; they realize radioactive energy is what killed him, and it was made to look like Superman's heat vision. An army of villains looking to collect on the bounty attacks them. Most of the villains are defeated and Captain Atom defeats the rest with a giant energy blast. All of Luthor's superhero team but Power Girl, whose loyalties are divided, attempt to capture the heroic duo. Superman creates a twister using his superspeed, and the two heroes escape with Power Girl. In Metropolis, Power Girl admits that she does not believe Superman killed Metallo. Luthor's superheroes catch up and the fight begins anew, Power Girl aiding Batman and Superman. Batman realizes that Major Force killed Metallo under Luthor's orders and goads him into admitting it in front of everyone. When Major Force begins angrily attacking him, Power Girl punches him in the stomach hard enough to rupture his containment suit, releasing his radiation. Captain Atom absorbs the energy, disintegrating Major Force and injuring himself in the process. Meanwhile, the missiles fail due to the sheer amount of radiation detonating them before impact. Amanda Waller discovers that Luthor has secretly been taking a serum composed of liquid kryptonite, making him lose whatever rationality he had left. Feeling disillusioned by his failure, Luthor decides to let the meteor hit the Earth so that he may rule over what remains of society. Batman and Superman battle Captain Marvel and Hawkman before breaking into Luthor's base of operations to retrieve data on the meteor's radiation. Luthor refuses to relinquish the data, going so far as to erase it from the lab computers, but Waller gives them a copy. Batman and Superman fly off to Tokyo to deliver the data on the meteor to the Japanese Toyman, who has already built a giant rocket-propelled spacecraft, intending to use it as a large missile to stop the meteor. Waller and the military then attempt to arrest Luthor, but he injects himself with more kryptonite steroid and dons a power suit. After escaping Waller and the military, Luthor follows Superman and Batman overseas. After Batman and Superman arrive at Toyman's base, he shows them the spacecraft, which resembles a giant, robotic composite version of Superman and Batman. With the data, Toyman is able to calculate the necessary reinforcements needed for the rocket so it will not explode before impact. Unfortunately, Luthor neutralizes Power Girl, Superman and Batman, and then disables the rocket's remote guidance systems so that it will not take off by itself. Having no other choice, Batman decides to fly the rocket himself, despite Superman's protests. Though initially faring poorly against Luthor and his kryptonite power suit, Superman eventually gains the upper hand and after an aerial chase back to Metropolis, Luthor is defeated. Batman succeeds in destroying the meteor, and Superman finds him alive in an escape pod. With the truth of Metallo's death now public knowledge, Superman is cleared of the murder charge and Luthor is arrested and taken away to face trial and impeachment for his crimes. Batman then returns to Gotham while the Daily Planet's star journalist, Lois Lane, arrives and happily embraces the Man of Steel. ^1 : Although voice-actress Jennifer Hale receives screen credit for playing Starfire, the character does not speak in the released version of the film and Hale is not credited for playing Killer Frost, a role she reprised from Justice League and Justice League Unlimited. In addition to Jennifer Hale's uncredited reprisal of Killer Frost, actors that reprise their roles from the DC Animated Universe include Clancy Brown, Kevin Conroy, Tim Daly, and CCH Pounder, who reprise their roles as Lex Luthor, Batman, Superman, and Amanda Waller, respectively. IGN reviewed both the standard and Blu-ray versions of the movie positively, awarding an 8.0 rating. This surpassed IGN's review of Superman: Doomsday, Batman: Gotham Knight, and Green Lantern: First Flight. The review score matched that of Justice League: The New Frontier. Superman/Batman: Public Enemies was released on standard DVD in single and double disc editions, along with a high definition Blu-ray release, on September 29, 2009. Special features for the double disc edition include an inside look of Wonder Woman, Batman: Gotham Knight, Justice League: The New Frontier, and Green Lantern: First Flight, DC Comics' 2009 crossover event Blackest Night, two production featurettes, a sneak peek of Justice League: Crisis on Two Earths, trailers of Green Lantern: First Flight, Fringe, and Batman: Arkham Asylum, digital copy download, and two episodes of Superman: The Animated Series picked by Bruce Timm. The Blu-ray edition has all the features of the double disc standard definition release including three additional Justice League episodes selected by Timm. At the DVD sales chart, Superman/Batman: Public Enemies opened at #5, selling 197,626 in the first week for revenue of $3,222,460. As of today, 527,482 units have been sold translating to $7,911,279 in revenue (This does not include rentals/Blu-ray sales). 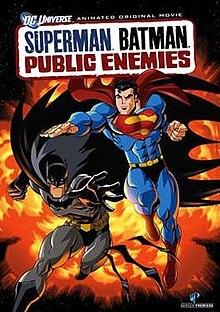 This makes Public Enemies the second highest selling DVD only behind Superman: Doomsday and the third most profitable of the ten movies in the DC Universe Animated Original Movies line-up. The good performance of the Superman/Batman: Public Enemies release has led Warner Premiere and DC Universe to release a sequel, Superman/Batman: Apocalypse, based on the Superman/Batman comic storyline "The Supergirl from Krypton". It was released on September 28, 2010. ^ Harvey, James (2009-06-29). "Press Release For "Superman/Batman: Public Enemies" Direct-To-Video Animated Feature". World Finest. Retrieved 2013-06-26. ^ a b "Superman/Batman: Public Enemies - DVD Sales". The Numbers. Nash Information Service. Retrieved 2011-03-31. ^ Renaud, Jeffrey (September 30, 2009). "LIU DIRECTS THE WORLD'S FINEST IN "PUBLIC ENEMIES"". Comic Book Resources. Valnet Inc. Retrieved July 1, 2016. ^ Iverson, Dan; Phil Pirrello (2009-09-24). "Superman/Batman: Public Enemies DVD Review". IGN. News Corporation. Retrieved 2010-05-21. ^ Monfette, Christopher (2007-09-18). "IGN: Superman Doomsday Review". IGN. News Corporation. Retrieved 2010-05-21. ^ George, Richard; Monfette, Christopher (2008-07-08). "Batman: Gotham Knight DVD Review". IGN. News Corporation. Retrieved 2010-05-21. ^ White, Cindy (2009-07-24). "Green Lantern: First Flight review". IGN. News Corporation. Retrieved 2010-05-21. ^ Worley, Rob M. (2009-10-16). "SUPERMAN/BATMAN 2 On the Way". Mania.com. Retrieved 2010-07-08. This page was last edited on 19 April 2019, at 21:53 (UTC).